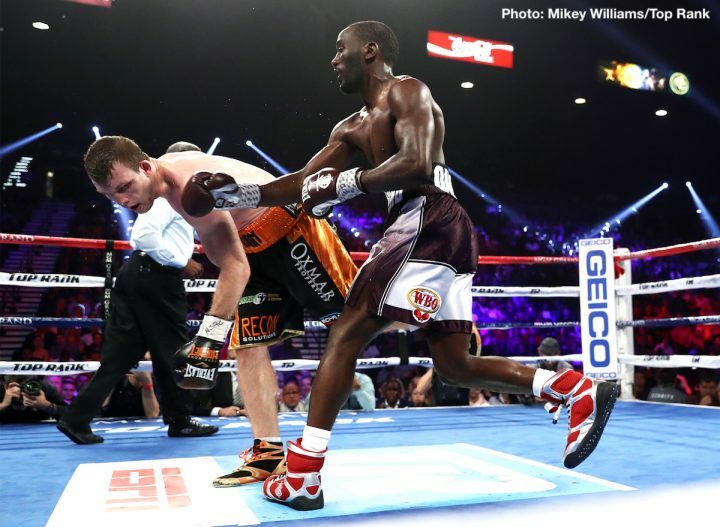 By Chris Williams: Promoter Bob Arum named the possible four opponents for Terence Crawford to face in his first defense of his WBO welterweight title on October 13 in Omaha, Nebraska. Crawford (33-0, 24 KOs) won the World Boxing Organization 147lb title last week in stopping champion Jeff Horn (18-1-1, 12 KOs) by a 9th round knockout on June 9 at the MGM Grand in Las Vegas, Nevada. Speaking with the Everlast TalkBox podcast, Arum listed Amir Khan, Lucas Matthysse, Jose Benavidez and Carlos Adames as all possibilities for Crawford’s next fight on October 13. The 24-year-old junior middleweight Carlos Adames (14-0, 11 KOs) and welterweight Jose Benavidez (27-0, 18 KOs) are both with Arum’s Top Rank stable, so they obviously are the leading candidates to face Crawford. Amir Khan is the least likely of the four to face Crawford, because he has the chance to fight Kell Brook on Sky Box Office PPV in December, and it would be an insane move on his part to fight a slick switch-hitting counter puncher like Crawford in his hometown of Omaha, Nebraska. Khan is more popular than Crawford, so it makes no sense for him to fight him in his hometown or to even face him at all. Arum included Matthysse, 35, as a possible option for Crawford to fight, as his fight against Manny Pacquiao on July 15 is now in doubt due to reported money problems with the financers of the bout in Malaysia. It’s still doubtful that Matthysse would take a fight against Crawford, because he could make more money by milking his World Boxing Association title against the contenders in the WBA’s top 15 rankings. Facing Crawford isn’t going to give Matthysse life-changing money, because he’s not a PPV star. Crawford is an ESPN+ fighter, and it’ unlikely he’ll ever be able to move from that spot to become a PPV. Arum can obviously try and push Crawford’s fights as PPV, but I don’t think it’s going to work. It’s not a situation where the boxing public is going to order Crawford’s fights just because Arum decides to sell them on PPV. Crawford-Matthysse is not likely to happen because of that. 2015, he’s now no longer well thought of by the boxing public. Benavidez Jr. and Crawford recently had words with one another that resulted in Terence inviting him outside. Nothing happened of course. But if they face each other on October 13, Benavidez can try and prove himself as the better fighter. I doubt that the boxing public will get excited about this fight, as it’s a dull one. There are only four fighters in the welterweight division that the boxing public wants to see face Crawford, and Benavidez is NOT one of them. The fans want to see Crawford fight Errol Spence Jr., Shawn Porter, Danny Garcia and Keith Thurman. Khan, Benavidez and Matthysse aren’t guys that the boxing fans are clamoring for to see face Crawford. Likewise, Carlos Adames is not one of the fighters the fans want to see face Crawford from the 154lb weight class. The only guys the fans would like to see face Crawford from the junior middleweight division is Jermell Charlo, Jarrett Hurd and Erislandy Lara. Arum isn’t mentioning any of those guys as potential opponents for Crawford to fight on October 13th, and it’s easy to see why. Crawford would go life and death with those fighters. I don’t care how many times Crawford switches from his orthodox stance to southpaw, he would have a real tough time on his hands trying to beat those guys. They would ignore Crawford’s tricks and spend the fight jamming power shots down his throat one by one. Unfortunately, I don’t think it would work out well for Crawford, and that’s why Arum likely isn’t mentioning their names, because things could go really badly for his Nebraska native.